And it's weirder than you expect. Salma Hayek as the title character. 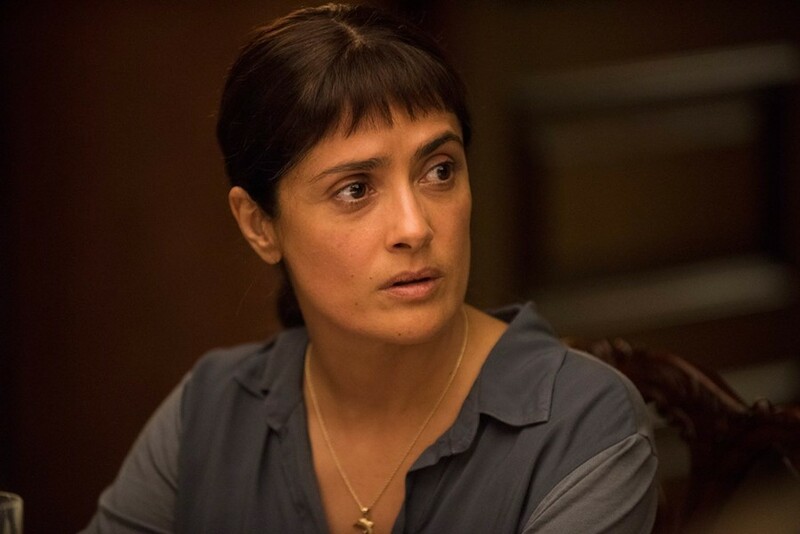 Beatriz at Dinner has the hallmarks of a typical Sundance feature: Goats as pets; Chloe Sevigny; a very attractive actor—in this case, Salma Hayek—saddled with bad bangs in an attempt to make her look “regular;” a Duplass brother (Jay) and underwater dream sequences. It’s a lot. But it was written by Mike White—he of the similarly toned Year of the Dog and The Good Girl, which was, like this, directed by Miguel Arteta. That means it’s deeper than it looks, weirder than you even think it will be, and achingly sad at its core. Beatriz is a holistic healer in Los Angeles. One of her pet goats has just been murdered. While at the home of a client (Connie Britton, the only nice rich person in the movie), her car breaks down, and she’s forced to endure a celebratory dinner for billionaire Doug Strutt (John Lithgow) and his team (including Duplass and his spouse, Sevigny; and his TV sister Amy Landecker), who’ve just locked down a development deal that will of course be disasterous for the environment. Beatriz eventually figures out that Strutt ruined a town near hers in Mexico, among other casual evils he reveals across the night (including that he hunts endangered animals in an unsubtle reference to Trump Jr.). The tone is so off-balance, so tense—the class stuff, such as when Strutt mistakes Beatriz for the help and asks for a drink, is so inevitably appalling that you already hate every non-Beatriz person before they even do anything—that whenever anything rather unbelievable happens, you’re on side with it right away. It’s a linemouthed condemnation of capitalism—that dead goat is symbolic—with one of the more shocking endings you’ve seen in awhile.